In January of 1996, nine year old Amber Hagerman was abducted while riding her bicycle at an abandoned grocery store parking lot in Arlington, Texas. Four days later, a man walking his dog found Amber’s body in a creek bed not far from where the abduction occurred. Her throat had been cut. An autopsy determined that she was killed two days after being abducted and that she had been sexually assaulted. A reader may not remember hearing of Amber Hagerman before, but, in all probability you have! Her abduction and murder provided the impetus for passing federal legislation often referred to as the Amber Alert System, designed to alert the public immediately about abducted children. 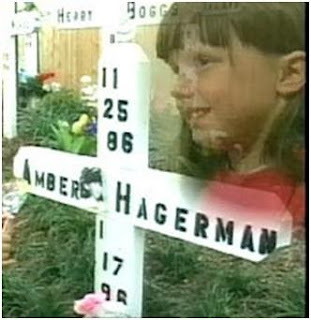 Among much of the sadness surrounding this case, is that 17 years later, while many other children have benefited by the use of Amber Alerts, Amber Hagerman’s murderer has never been identified. On the day of her abduction, Amber and her six year old brother, Ricky, had ridden to the abandoned store together on their bikes. A few minutes after arriving at the store, Ricky returned home. Amber remained there, continuing to ride her bike. When her grandfather, Ricky Whitson, went to the store looking for Amber, he was met by police. They had received a call from a neighbor, Jim Kevil, who told police that he saw a white or Hispanic man in a truck pull up to her, jump from the truck, and grab her. When she began to scream, Kevil called police. Here’s what is known or deducted from evidence, psychological profiling and other means. This was likely a crime of opportunity, meaning that when he saw her alone, the murderer seized the opportunity to abduct her. Investigators believe that the man was familiar with the area. He is believed to have been at least 25 years old and worked or lived near the scene of the abduction. Because he kept Amber alive for two days after the abduction, it is likely that he had a place close by where he kept her. A truck similar to the description given of the murderer’s truck was seen at a nearby laundromat before the abduction, but has never been located. The witness is said to believe the truck was a dark color. Very little else is known about the murder. Amber Alert systems are now been authorized and in operation around the world. Such Alerts have been credited with the rescue of more than 300 missing and abducted children. That is a great legacy for a little nine year old girl to leave behind. Amber’s family may take some solace that her death has played a part in saving other lives. The fact remains, however, that for more than 17 years, a Texas murderer has gone unidentified. Has he killed again? Is there another murder in his future? We don’t know the answers to those questions. We do know that Amber Hagerman’s memory should remain with each of us and that her murderer deserves to be brought to justice.